If you're a higher-education student in a post-secondary institution living in one of the eight countries below, you should now be eligible for YouTube's student membership. 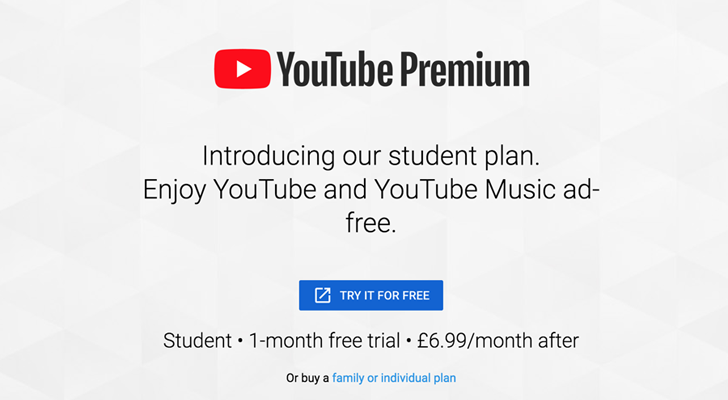 In the UK, that means Music Premium is £4.99 instead of £9.99, and the full YouTube Premium suite is £6.99 instead of £11.99. To verify your eligibility, go to the YouTube Music Premium (only music) or YouTube Premium (both music and regular videos) pages, tap to get started, and then enter your school on the SheerID form. If it shows up, then student pricing should be available for you. You'll have to re-verify every year, and can benefit for a maximum of four. Keep in mind though that if you're already subscribed to Premium, you'll need to cancel first then get the student membership.